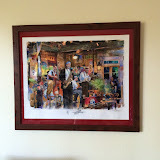 There was a painting we bought during December 2013 in New Orleans that had been lying around in a roll in the trunk of my car. A year and half later, it’s finally up. I’ve hung up photographs before, which is usually just a simple affair of inserting it into the frame the right way. Properly mounting a painting has a lot more to it — and while I cut several corners in this attempt, I know about things I can improve on1 next time.